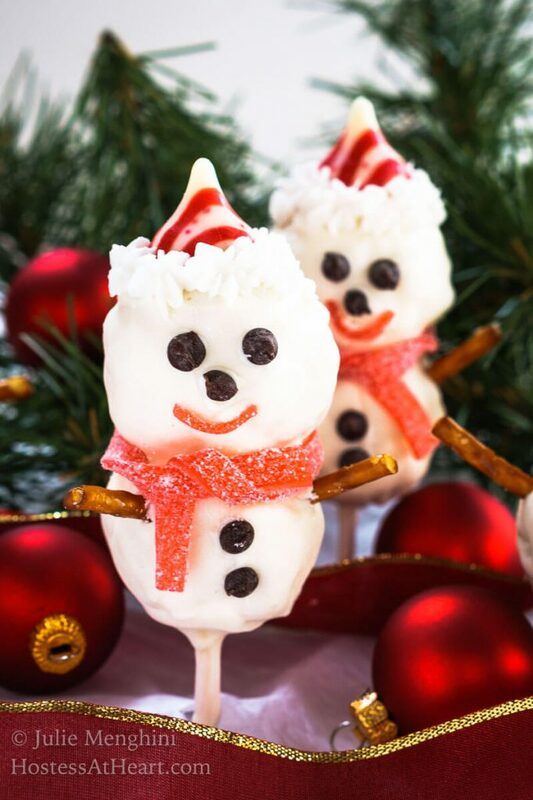 Rice Krispie Snowman Pops & Cookies are quick, easy and a lot of fun. Best of all, everyone loves them and clean-up is a breeze. When my children were young we made cut out sugar cookies every year. It was an all-day ordeal and such a mess. 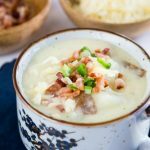 Every year I’d go crazy and make a double batch. After about an hour the kids were done and I was finishing up by myself. 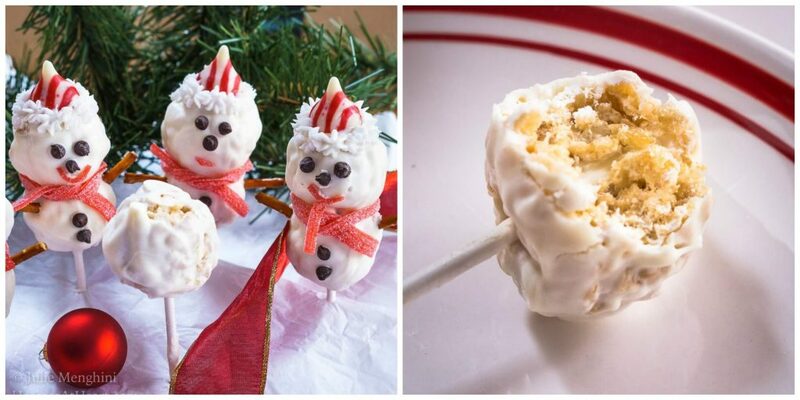 The idea of doing Rice Krispie Snowman Pops & Cookies was an idea that will be repeated next year. 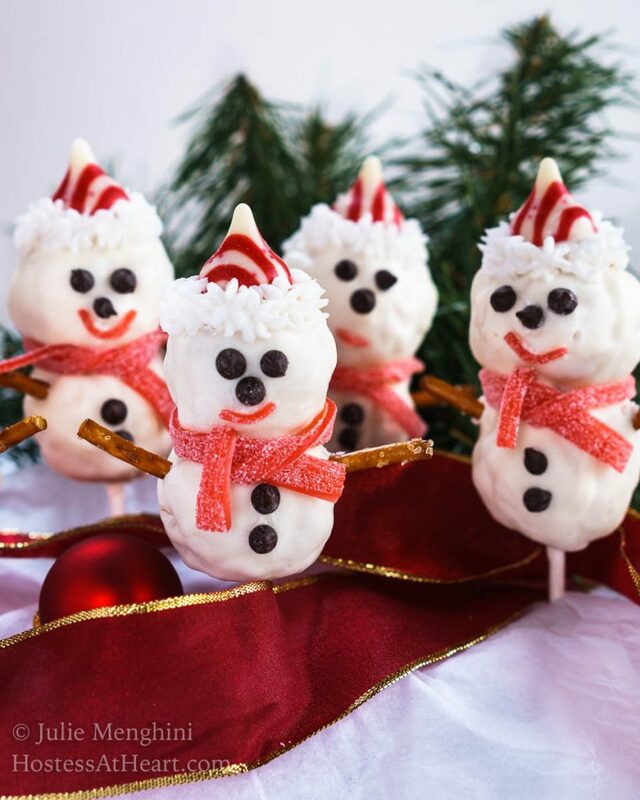 These snowmen pops have cute little chocolate chip eyes, striped candy hat and candy mufflers. 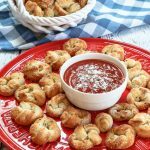 They’re so easy to make that the kiddos will love to help. One of John’s favorite treats is Rice Krispie treats. I’ve actually made them and put them in a heart-shaped pan for Valentine’s Day. That may sound lame to a lot of people, but it means a lot to him so I knew he would love these Rice Krispie Snowman Pops & Cookies. I was thinking that I’d never made a holiday Rice Krispie treat for Christmas. It didn’t take me long to come up with the idea for this one and even less time to put them together. Gone was the hours of rolling and cutting and baking and frosting….well you get the idea. The snowmen came out kind of bumpy and lumpy, just like the real ones! 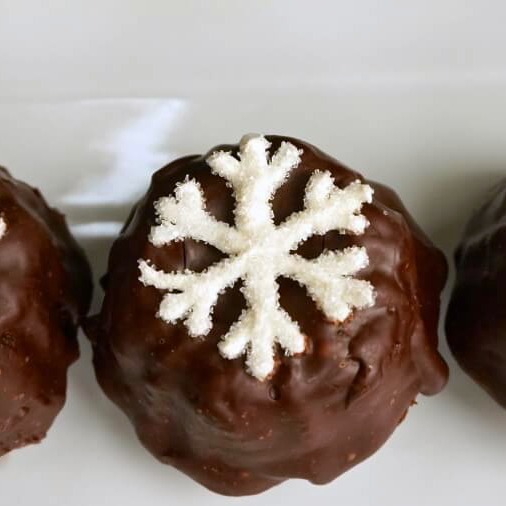 I just made my Rice Krispie treats and used a cookie scoop for my snowmen and then rolled what was left out on a rimmed baking sheet and stamped out what cookies I wanted. I mixed up one batch of buttercream frosting and colored some of it green for the cookies. You could use prepared frosting to speed everything up. 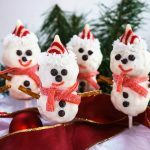 Rice Krispie Snowman Pops & Cookies are quick, easy and a lot of fun. Best of all, everyone loves them and clean-up is a breeze! Decorative sanding sugar and candy of your choice. In a large bowl, melt butter and marshmallow together and microwave in 1-minute increments at 50% power, stirring after each increment. Add Rice Krispie cereal to melted marshmallow and stir to combine. Scoop Rice Krispies into a tight ball and thread two balls onto each stick. Set aside and allow them to cool. Put remaining Rice Krispie treats onto a rimmed baking sheet. Roll flat with a rolling pin. Stamp cookie shapes out with cookie cutters. Melt candy melts In a medium-sized bowl in the microwave in 1-minute increments at 50% power. Stir between increments until melted candy is smooth. Allow them to cool to touch. Once cool, spoon candy melts over snowmen. place upside down and allow candy melts to harden on waxed paper. Prepare white frosting. 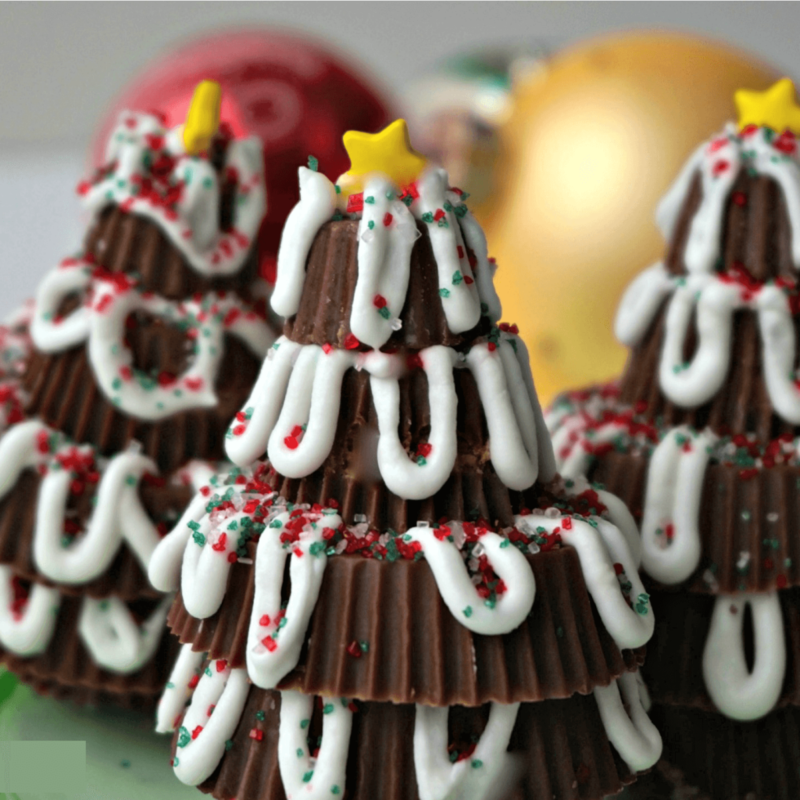 Dip the bottom of candy kisses in frosting and attach hats. Repeat with chocolate chips for eyes, nose, and buttons. Cut candy leather and wrap a scarf around the neck. Put a small amount of frosting in the piping bag or ziplock bag. Snip a small opening and pipe stars around candy kiss hat. Put two holes in the sides of the snowman with a toothpick or other sharp item. Push in pretzel stick arms. Frost tops of cookies and decorate as desired. One word of warning, let your candy melts cool before dipping them. Otherwise, they will melt the marshmallow and “heads will roll”! That missing head was delicious. Research, you know. 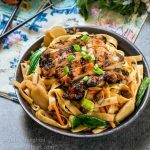 If you like fun projects like this one, take a look at these! *This post may contain affiliate links. I receive a small commission at no cost to you when you make a purchase using my links. Click here to read my full disclosure policy. Julie, these are the cutest!! I’m in LOVE with the little candy scarves. 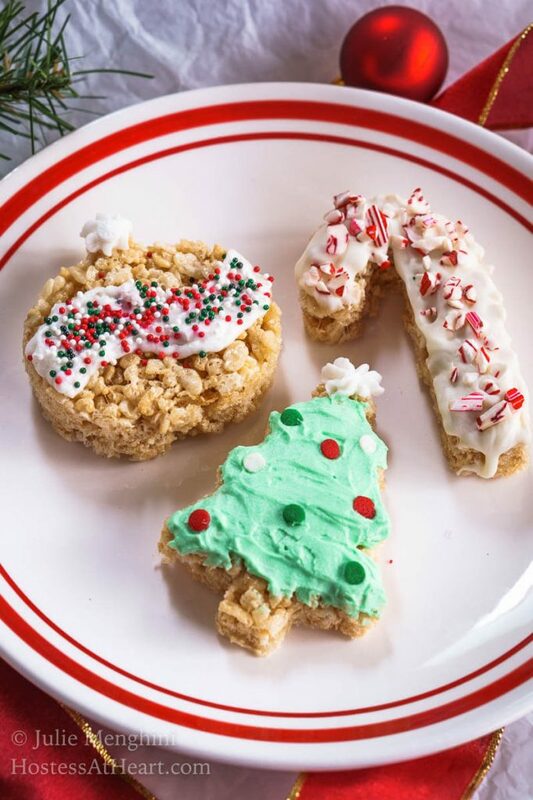 These treats are sooooo cute and Christmasy! Thank you Nancy! They were fun too! 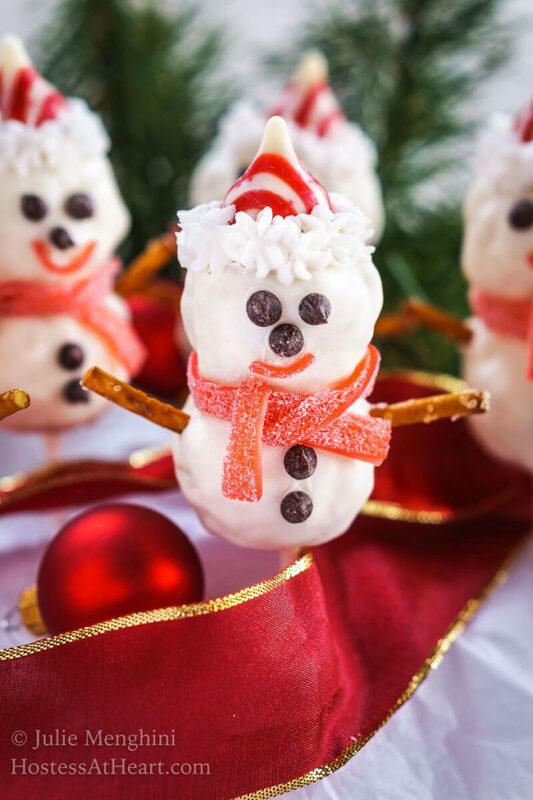 LOL – I knew these cute little snowmen had to be a creation from Julie! I like to use Rice Krispies in treats as I frequently make them for the kids. Thanks for bringing these to the party and thanks for a new way to use a favorite cereal when I ate cereal. Saw these on Instagram and just thought they were the cutest things. Very creative Julie! They were a lot of fun Loretta! John loved them. I still have a few hiding in containers for the little neighbors. Too cute Julie! 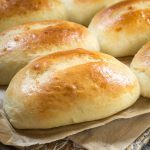 I have just begun the baking and having a great time with some new recipes for sweets. Did you all get snow??? Cheryl- Happy Holidays! Thank you, Cheryl! They were so much fun. I’m just getting into my baking too. It’s snowed twice here but there isn’t anything on the ground. Just cold and grey 🙁 Happy Holidays to you too!